For anyone considering the modification, remanufacture or repair of classic coachbuilt bodywork, the English Wheel must be one of the first solutions that comes to mind. Where off the shelf panels are not available it provides the means to create beautiful compound curved shapes in steel and aluminium the way craftsmen have for the bulk of the petrol age. 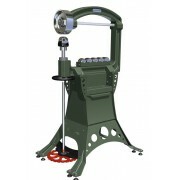 That solution might then be swiftly discounted, as English Wheeling is seen as something of a ‘dark art’ and it is now practiced by so few craftsman that they command a justifiably high premium to apply their skills. It is true that it is not a skill that can be learned overnight and a book or even Youtube video will not help you pick up the fundamentals, though they can enhance your method in the long run. You may have read our short history of the English Wheel (you can read it here) and learnt of our training course to get you started, but the other key piece of the jigsaw is the selection of the actual Wheel itself. In the past you were limited in choice. There were original Wheels, often pre WW2, which occasionally come up on auction sites. They invariably require refurbishment to the wheel and anvil and their bearings, yet still sell for several thousand pounds. The fact that you require heavy lifting equipment to move them doesn’t exactly add to their appeal. 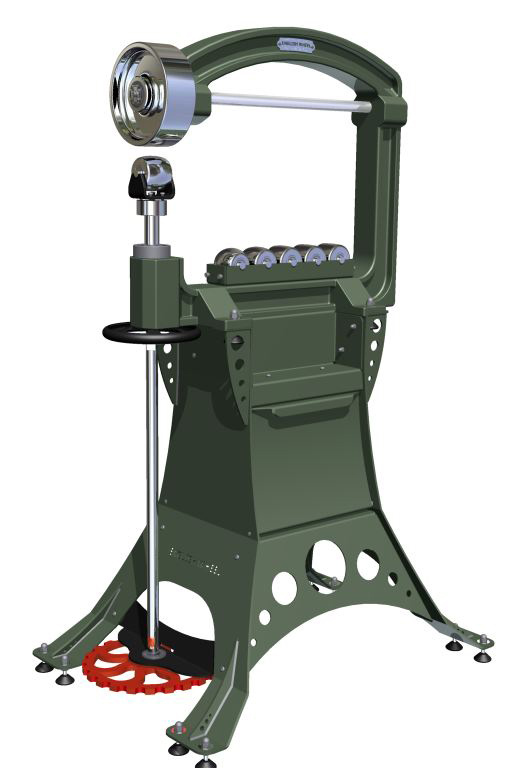 Then there are modern workshop machines, often from the USA, which are similar in price and requirement for mechanical handling. These are good if you are recreating very large panels on a regular basis but most small workshops/amateurs don't need anything that large. At the other extreme there are low cost, welded frame wheels from the Far East that vary in performance and capability to do the job. At this point it is worth talking about what makes a good wheel. To the uninitiated it seems obvious, the frame needs to be incredibly rigid to keep the wheel and anvil held together even whilst forcing the metal sheet between them. It is here that the first misconception takes place. Whilst it’s not too difficult to make the frame rigid in terms of vertical thrust between the wheel and anvil, it is actually better if you have a little ‘ductility,’ or springiness, so that the sheet is clamped whilst moved back and forth. On the other hand, it is critical to prevent the wheel and anvil tracking different paths sideways, which they try to do under the force of the metal sheet passing between them and being steered by the operator to form those lovely curves. This level of ductility and tracking rigidity is what separates the real wheels from the lookalikes and is where the poorly made wheels fall over. You will just get frustrated with these machines and dismiss Wheeling as a black art for wizards. 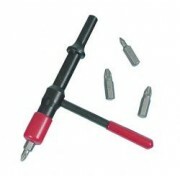 They’re made in factories producing lots of different tools, copied from western samples or even photos. The guys making them will never use one, so they don’t have any connection with how it needs to work. Then there are the anvils which require a high degree of accuracy to ensure perfect wheel to anvil contact and longevity. You’ll notice on some of these examples that they have a solid steel wheel, in fact that is often used as a selling point, but if the wheel itself has a lot of mass it causes inertia, making it difficult to control the panel as you wheel it back and forth. We know all this because we’ve been researching Wheels for some time and never found one we believed in, so we decided to put a package together with an acknowledged expert. Justin Baker started off refurbishing original pre-war wheels and has been making his own for over a decade, mainly for the aviation market. His wheels have been used for such diverse requirements as the repair fo the famous ‘Grace’ Spitfire and the restoration of Donald Campbell's ‘Bluebird’. His workshop is in the next town to us and we’ve been talking to him for three years whilst this latest evolution comes to fruition. We’re now really pleased to be able to advise that we have developed a wheel package with him aimed directly at the enthusiastic amateur and smaller professional workshop. Justin Baker knows English Wheels. Many years ago, he was asked by a friend to help restore a wheel that was close to 100 years old. At that time there was very little information available, the generations that had used the tools in their day to day work had long since retired and extensive s..
OUR MAY 2019 WHEELING COURSE Saturday 18th May Who isn't fascinated by 'Wheeling' or 'English Wheeling' as everyone else in the world knows it. 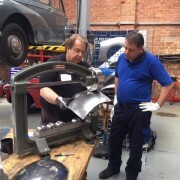 Transforming metal from a flat sheet into the beautiful compound curves the way Aston Martin, Bristol, Supermarine, Alvis and more us..
OUR JUNE 2019 WHEELING COURSE Saturday 22nd May Who isn't fascinated by 'Wheeling' or 'English Wheeling' as everyone else in the world knows it. Transforming metal from a flat sheet into the beautiful compound curves the way Aston Martin, Bristol, Supermarine, Alvis and more u..